Cannot determine the ships name but the company is Blue Star Line. Known for their prominent red funnel with a single large blue star. In the Stanley Kubrick film Full Metal Jacket, the scenes set in Huey with the sniper were shot here before the site was demolished. 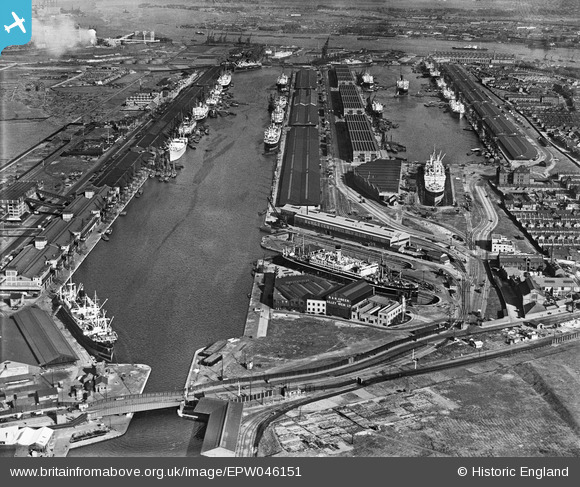 The Royal Docks were once the largest stretch of enclosed water in the world (235 acres and ten miles of quayside), following the construction of the King George V Dock in 1921. The Royal Victoria Dock was completed as early as 1855 and this was followed, in 1880, by the Royal Albert Dock. The so-called Royals may be seen in their heyday as one huge dock system divided into three sections. 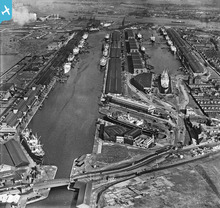 Apart from bulk imports of grain and meat, mostly from the Commonwealth and Argentina, the new King George V Dock was able to handle the biggest liners of the Interwar period, so passenger cargoes were big business. The busiest and most prosperous times for the Royals were from 1910 until the 1960s, with the exception of the war years 1940-45. With the changing technologies of the postwar years, the docks' trade and employment declined after the mid-Sixties. Substantial losses resulted eventually in closure of the docks for general cargoes at the end of 1981 and reports at the time mentioned the problems of economic and social deprivation in this part of East London (North Woolwich and Silvertown). The London Docklands Development Corporation was set up in 1981 to regenerate this area along with other zones alongside the Thames. The flagship project was the opening of London City Airport six years later, built between the Royal Albert and King George V Docks. Although some of the impressive warehouses have been preserved, the Royals have seen the development of several industrial estates, a university campus, new roads and rail links, riverside parks and gardens, in addition to increased facilities for tourists and visitors.